I had no idea what I was in for on this beautiful Wednesday. It was Regatta Day in St. John's, Newfoundland but it was a little too dreary for my taste. 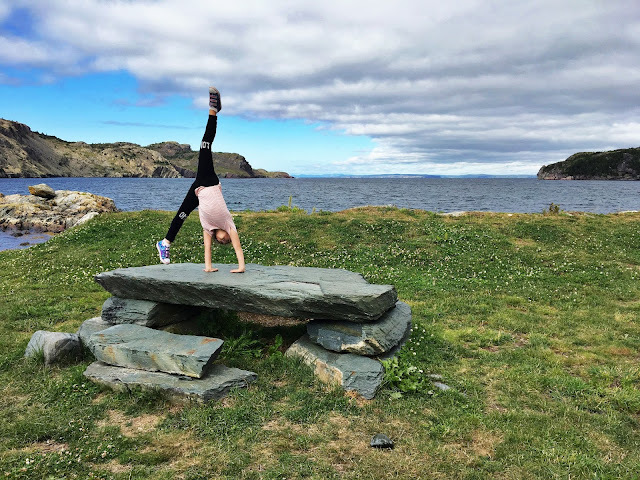 Wanting to take advantage of the gorgeous weather, we decided to head to the Brigus Tunnel instead of the Quidi Vidi crowds. Visiting Brigus was my husband's idea. Last summer, he mentioned there was a tunnel in Brigus that he went to as a child that he'd like to show us. You have to understand that my husband does not have an "up and at 'em" attitude so this is already quite an accomplishment - to suggest somewhere to go. Truthfully, I was unimpressed as I was picturing a giant rock with a hole in it. As we escaped the city with Starbucks in hand, we headed up through the Conception Bay Highway to the Baccalieu Trail Route 70. 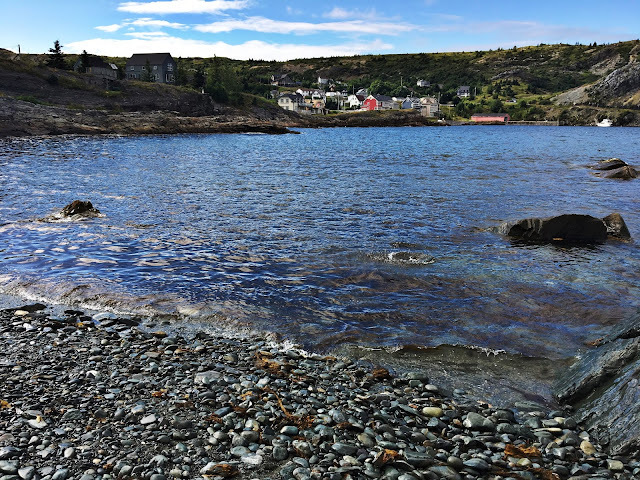 We passed through Kelligrews and Seal cove, then Holyrood making sure to remember to go to the swimming hole at Holy Cross Park on another day. On through the little towns of Conception Harbour and Colliers. The drive is beautiful as you wind around the Avalon coastline. 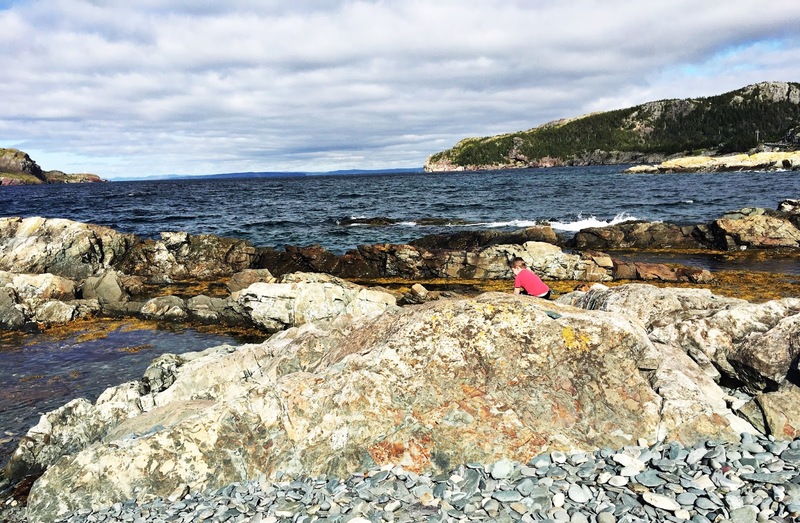 We skipped off the main road to explore Kitchuses and Bacon Cove where we found an amazing site to see: this sunken ship, the Old Whaler... and well, that's about all I know. 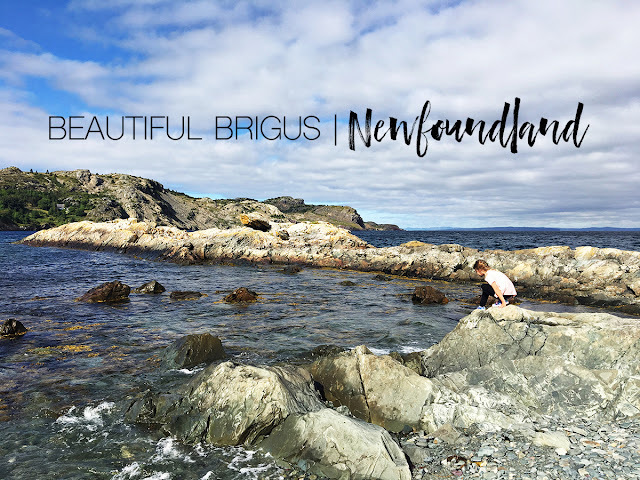 Brigus is about one hour's drive from St. John's and if I didn't hear the whining and complaining in the backseat of our Jeep, I would have said the drive went by fast. Soon, we were entering the narrow streets of the tiny town. It reminded me of the Quidi Vidi gut yet it was clear this place is rich with culture. Our first stop was when we noticed the street name "Jane's Hill". Our daughter's name is Jane so it was fitting that we would stop here directly in front of the St. George's Heritage Church. If my four year old son wasn't such a sloth, I would have just parked the car right there and wandered around. Instead we got back into the car and followed the signs to "The Tunnel". It's not a big town, you won't get lost. Not for long anyway. When we turned down the little street towards the Brigus Tunnel we had to pull over almost into the brick wall on the right hand side to let a truck go by. That was narrow. A close call really. I would be a little weary during winter here. The parking lot had a couple cars - again, I was surprised to see actual humans wandering around. I wondered why people were here today - a random Wednesday. You see, I didn't know what I was in for. I noticed the rock picnic tables right away as my daughter did cartwheels up and over top of them. The view was incredible as we looked into the Atlantic Ocean at Bishop's Beach. 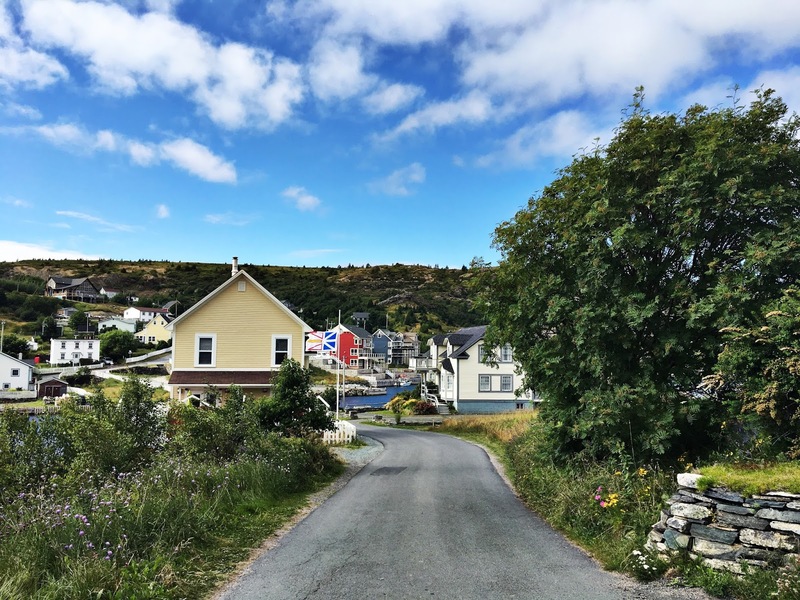 On the left you could see the houses of the little town up along the hill and to the right you could see the narrows where inevitably boats would come into the harbour. 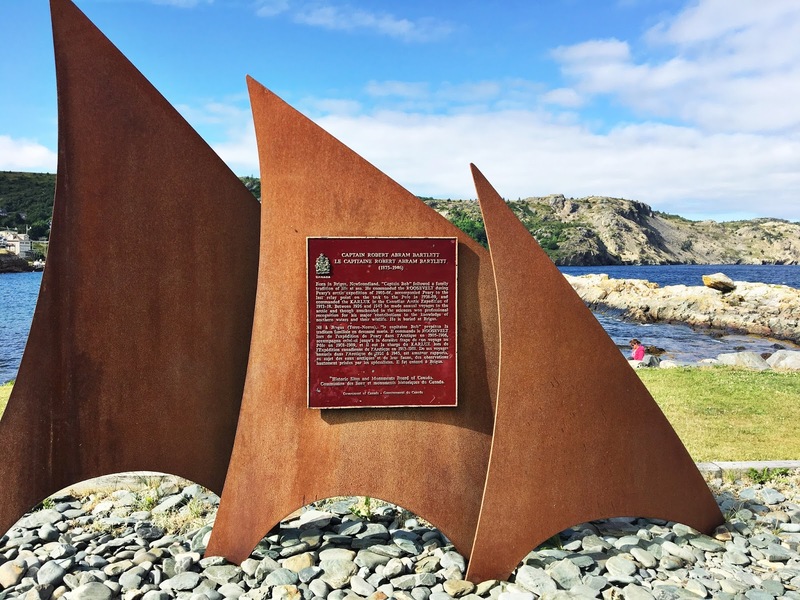 It would seem that Brigus was where Captain Bob Bartlett, famous for his Artic Exploration, would call home. 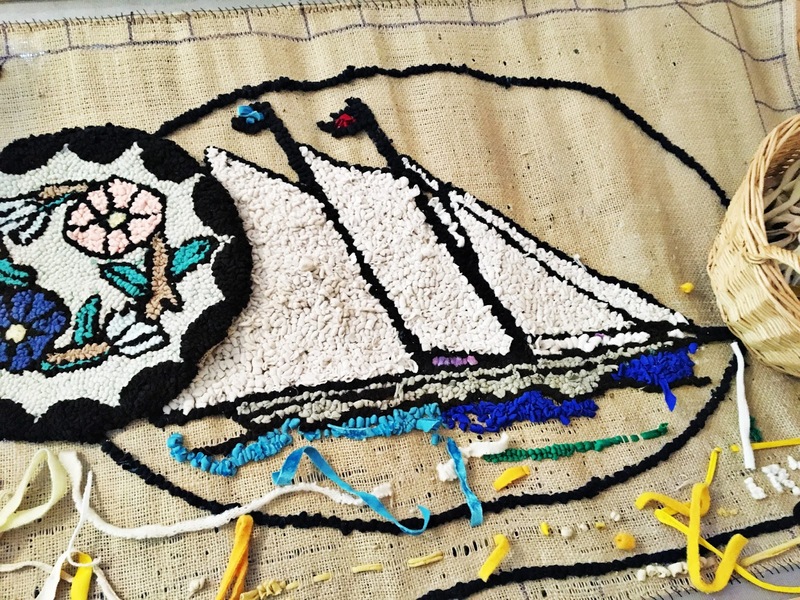 This tunnel was handmade over the course of four months and would be how the vessels could board their ships. I will admit, its super cool as you can almost feel the history as you walk the short distance. If picnics are your jam, then this place is for you. Not to mention if skimming rocks is up your alley, then these beach rocks were made just for you. Of course, it goes without saying Ryan Caines impresses every time with this. He's got a ways to go to help his offspring. 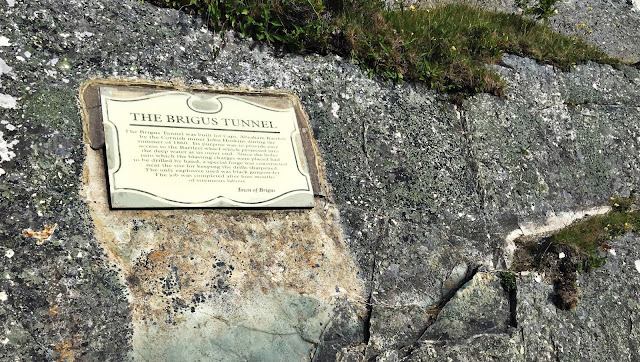 As we left the Brigus Tunnel area, we entered into the small narrow streets again. I saw the greenery and could smell the salt ocean in the air. To my left we saw the lobster traps and couldn't help but take a picture. Wow. Simply gorgeous. 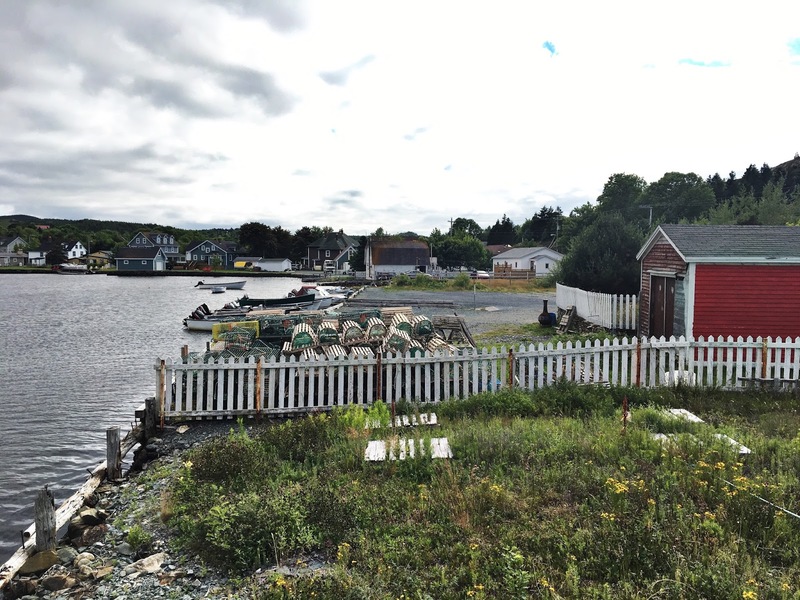 Soon we would find the Hawthorne Cottage National Historic Site where Captain Bob Bartlett and his family lived in the 20th century. The exterior of the home was beautiful and the gardens were breathtaking. 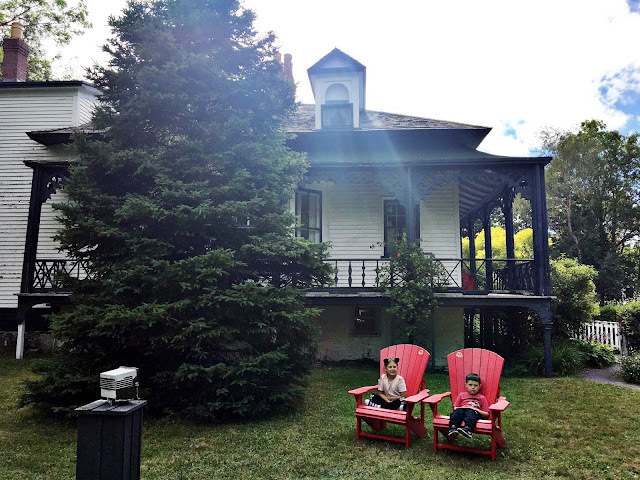 Admission was free to enter the cottage so our family of four went inside. 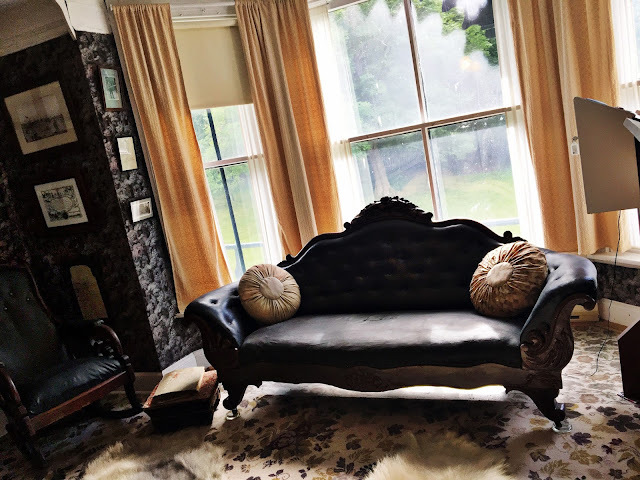 The cottage was perfectly preserved and there was an incredibly helpful guide was on site. The furniture and the artifacts, as well as the pictures on the wall of famous presidents and politicians told a story. However, with a seven year old and four year old, you won't be here long. A simple drop by is enough for us. In the same area was the Town Hall, the John Leaman Museum and the Country Corner, where you can find their World Famous Blueberry Crisp. Of course, this was something I had to try for myself. When you enter the building you first enter a craft store. Inside were Foggy Island Candles and gorgeous hand blown glass. 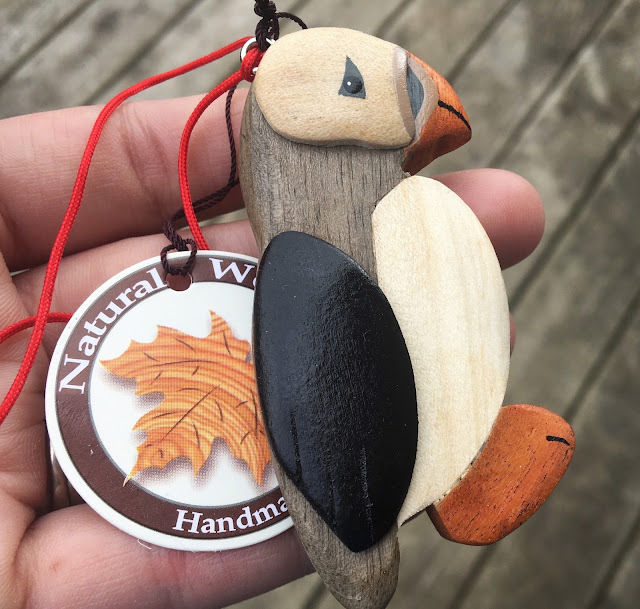 I picked up a wooden puffin ornament and a pencil case for my son who would be starting school soon by Purple Day Designs. Through the craft store was a small ice cream bar but this is where you can get your blueberry crisp and select pastries. 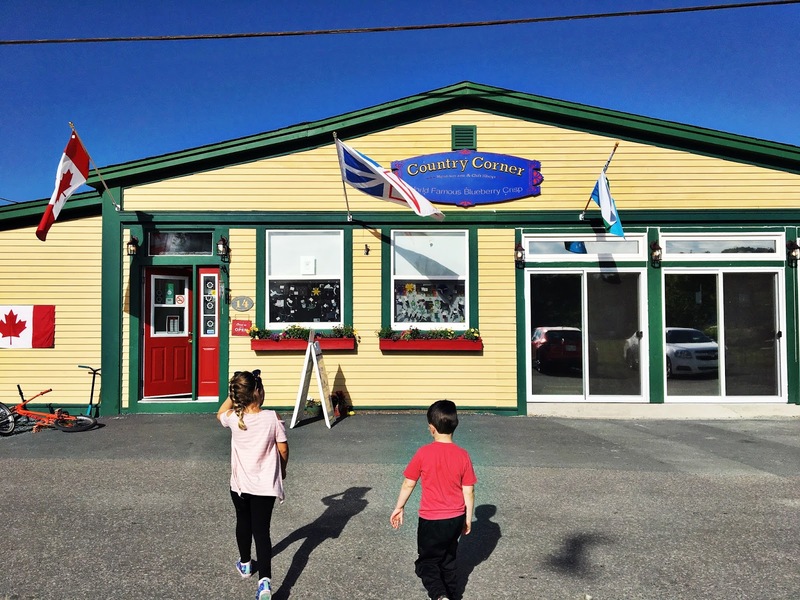 Looking back, I wish I had gotten some of their chowder or fish and chips but that's only an excuse to go back to this beautiful town. My husband had the chocolate chip cookies and was very impressed, giving me a two thumbs up. Across the street is a baseball field with some picnic tables and some gardens so it's a great place to stop and have your messy eats. 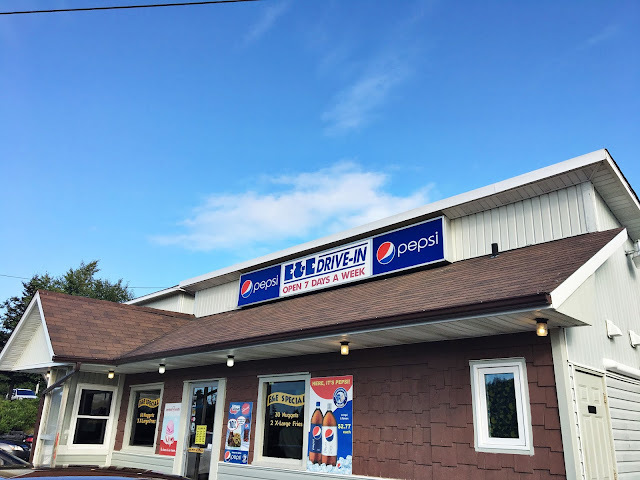 We were told by many people to try E&E Drive-in, previously known as Ernie's. This take-out restaurant is known for their chicken and fries. Of course, this is what I tried - a wing and fries combo. 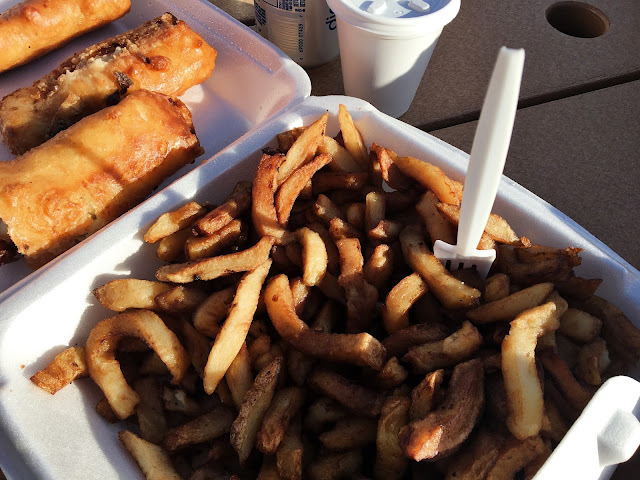 My husband would have the fish and chips and my kids had the nuggets. They were really friendly and informative as I always have questions... "what's the best thing on the menu?" There was also ice cream and I've been told they make an amazing milk shake. E&E Drive-in is not anything special to look at. It was busy when I got there as almost a dozen people were waiting or placing orders. You have to be specific in what you want like the number of forks and ketchup packages. It does not have any tables inside but there are two outside. With that said, it seems to hold some kind of small town charm. Note that there's no kids meals from what I could tell and drink choices were limited: Pepsi, Diet Pesi, Orange Crush or Birch Beer. Odd, I know but seemed to fit the "personality" of the diner. As with many of our adventures by the time we've hit a couple hours, we all need a break. 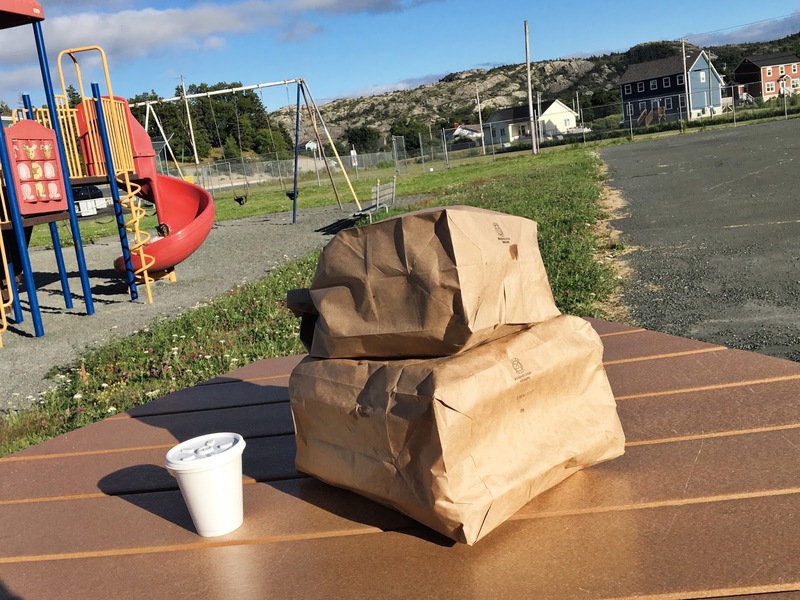 We scoped out a park with a picnic table to check out what was inside our brown paper packages. The food was greasy and plentiful. The chicken, which was a full wing was better than the fish despite being the same batter. It certainly was different but not quite my cup of tea. I'd highly recommend the park, which was on the main road. Next time, I'd like to visit the Paint Cafe and the John Leaman Musuem: Ye Old Stone Barn. 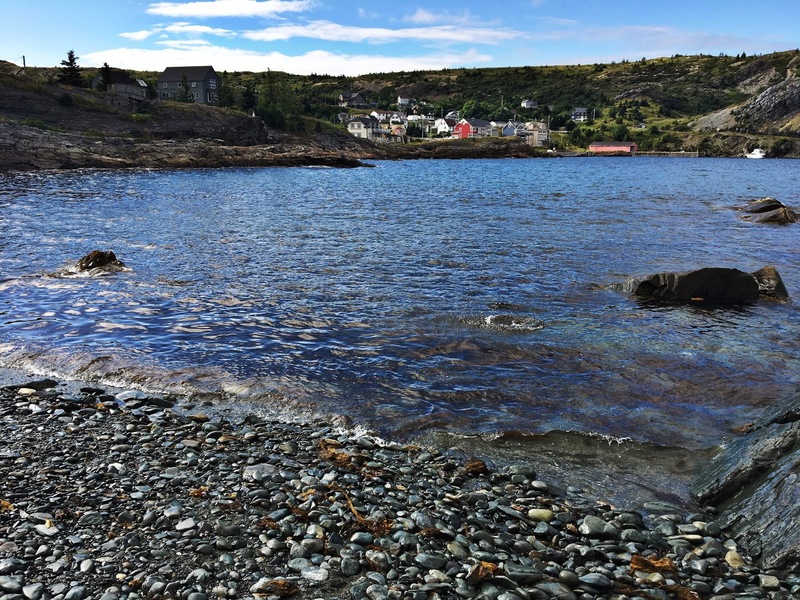 What a beautiful day it turned out to be in Brigus. You should go. 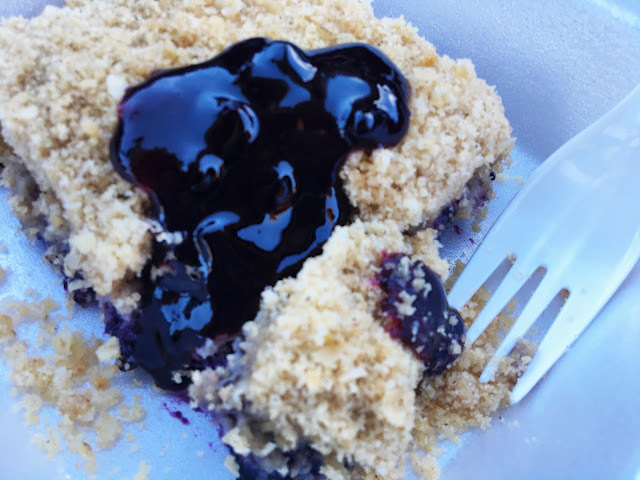 I will add that there is a Brigus Blueberry Festival every year in mid August. It might be a great time to enjoy all of this and so much more.